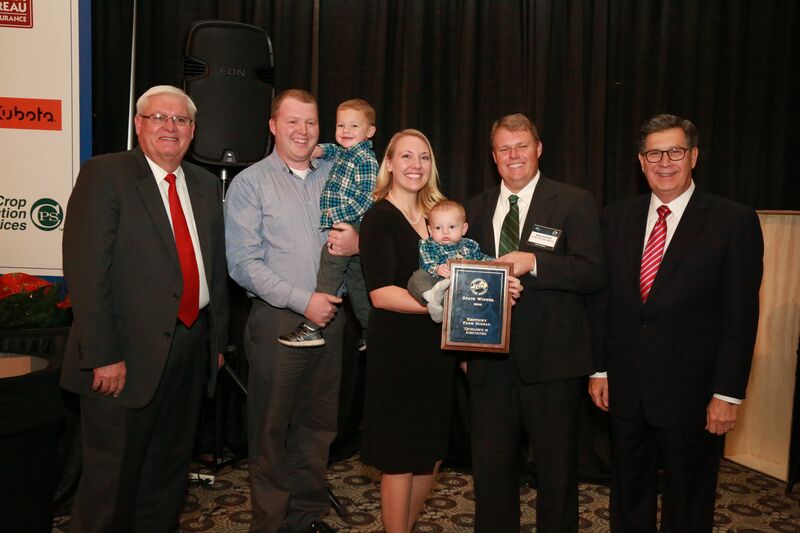 Louisville, KY (December 2, 2016) – Ryan and Miranda Chaplin of Bourbon County won top honors in Kentucky Farm Bureau’s (KFB) Excellence in Agriculture Awards program during the organization’s 97th annual meeting in Louisville this week. Ryan Chaplin (center left) and Miranda Chaplin (center) received the 2016 Excellence in Agriculture Award at Kentucky Farm Bureau’s 97th annual meeting, held in Louisville. The award was presented by Mark Barker (center right), for Farm Credit Mid-America, Mark Haney, KFB President (left), and David S. Beck, KFB Executive Vice President (right). The Excellence in Agriculture competition awards first, second and third place distinctions each year to individuals or couples under the age of 35 who contribute to and exhibit leadership growth from consistent involvement in Farm Bureau and other agriculture and civic-oriented organizations. To qualify, contestants must not have the majority of their income subject to normal production risks associated with farming. For the win, the Chaplins will go on to represent Kentucky in the national competition at the American Farm Bureau Federation (AFBF) annual convention, held in Phoenix, AZ, January 6-11, 2017. The Chaplins were presented with a John Deere Gator, courtesy of Farm Credit Mid-America, and an expenses-paid trip to the AFBF annual meeting courtesy of Kentucky Farm Bureau. Ryan Chaplin is a research facilities manager for the Meats Laboratory at the University of Kentucky. Miranda Chaplin is the operations/outreach director for Curriculum for Agricultural Science Education. They were both raised on beef cattle and hay family farms. Second place in the contest went to Steven and Ashley Debord of Pulaski County. They were awarded $400 courtesy of KFB. Mike Meyer from Harrison County placed third and received $300 from KFB. When the Chaplins compete for top national honors next month in Phoenix, they will be vying for their choice of either a 2017 Chevrolet Silverado or 2017 GMC Sierra, courtesy of General Motors, and a paid registration to the 2017 AFBF FUSION Conference in Pittsburgh, PA, February 10-13, 2017. Three national runners-up will receive a Case IH Farmall 50A, courtesy of Case IH, a $2,500 cash prize and $500 in STIHL merchandise, courtesy of STIHL.